"I will do anything except that which offends my common pride." 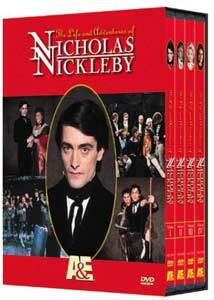 The Life and Adventures of Nicholas Nickleby is an adaptation of one of Charles Dickens' innumerable novels. Like many filmed versions of this famous author's literary works, Nicholas Nickleby is an extremely lengthy production, clocking in at nearly nine hours. Nevertheless, this stage performance of Dickens' tale of hardship and redemption is often riveting and engrossing despite its inflated running time. Set in Victorian England, the story follows the travels of Nicholas Nickleby (Roger Rees) who, after the death of his father, is forced to seek help from his cruel uncle Ralph (John Woodvine). Intelligent and headstrong, Nicholas eventually touches the lives of many, and finds both heartache and contentment through his series of adventures. Performed on stage by the remarkable Royal Shakespeare Company, Nicholas Nickleby is a captivating (though often depressing) tale that emphasizes the strength of honor and compassion in a selfish and cruel society. Perhaps the most entertaining element of Nicholas Nickleby is the masterful execution of the stage production. Particularly noteworthy is the camera coverage of the event, and the way in which the viewer is simultaneously given a chance to experience what it was like to be in the audience as well as on stage with the actors. Through the meticulously crafted sets and costumes, we are seamlessly transported to Victorian England. Though much praise can be lavished upon the production design, the performances are the true standout of this theatrical undertaking. Only 42 actors were hired to play 250 characters, and each performer handles multiple roles expertly. So engrossed are these entertainers in each of their many personalities, that I hardly noticed the on-going recycling of actors. If Nicholas Nickleby has a major fault, it is the excessive running time. Though the production attempts to stay faithful to Dickens' work, I found a great deal of monotony and redundancy throughout the performance. At the same time, several important characters and plot points that were crucial to Dickens' novel are absent. The combination of these two contradictory elements may leave some viewers feeling bloated yet still hungry for more. While The Life and Adventures of Nicholas Nickleby may not be the quintessential telling of Dickens' story, it is an admirable piece of work that just might win over those who are not typically fond of period pieces. Image Transfer Review: The 1.33:1 image transfer is quite impressive for its age. Black level is rock solid, lending a great deal of depth to the picture. The print is smooth with few distracting artifacts. The lack of color saturation dates the image a bit, but otherwise this is an impressive transfer that exceeded my expectations. Audio Transfer Review: The stereo soundtrack is adequate. The audio is typically monaural with occasional stereo effects. Spoken words are clear and intelligible, though there is a slightly harsh characteristic to the overall fidelity. This is a very subdued soundtrack that suits the material admirably. Extras Review: The Charles Dickens episode of A & E's Biography series is a fantastic complement to the main feature. This is a fascinating study of the famous author, offering a vast wealth of information on his works. My only complaint is that I did not view this telling documentary before I watched The Life and Adventures of Nicholas Nickleby. Also included is an impressive Charles Dickens Text Biography/Bibliography. The Life and Adventures of Nicholas Nickleby is undoubtedly an expertly crafted production, yet I hold certain reservations in recommending this version of the Dickens classic. Rather lengthy, it often feels tedious, yet major omissions have still been made from the novel. This may deter serious Dickens fans from embracing this version of the frequently filmed story. Casual fans should wait for the more recent Douglas McGrath film, slated for a DVD release later this month from MGM.